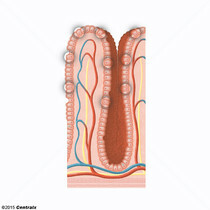 Lining of the INTESTINES, consisting of an inner EPITHELIUM, a middle LAMINA PROPRIA, and an outer MUSCULARIS MUCOSAE. In the SMALL INTESTINE, the mucosa is characterized by a series of folds and abundance of absorptive cells (ENTEROCYTES) with MICROVILLI. 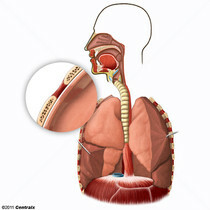 The thin serous membrane enveloping the lungs (LUNG) and lining the THORACIC CAVITY. Pleura consist of two layers, the inner visceral pleura lying next to the pulmonary parenchyma and the outer parietal pleura. 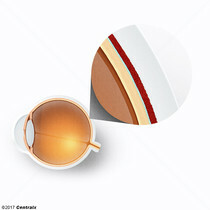 Between the two layers is the PLEURAL CAVITY which contains a thin film of liquid. A conical fibro-serous sac surrounding the HEART and the roots of the great vessels (AORTA; VENAE CAVAE; PULMONARY ARTERY). Pericardium consists of two sacs, the outer fibrous pericardium and the inner serous pericardium. 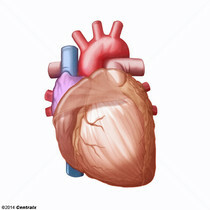 Serous pericardium consists of an outer parietal layer and an inner visceral layer next to the heart (epicardium) with a pericardial cavity in between. 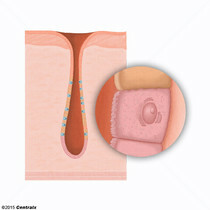 A basement membrane in the cochlea that supports the hair cells of the ORGAN OF CORTI, consisting keratin-like fibrils. It stretches from the SPIRAL LAMINA to the basilar crest. 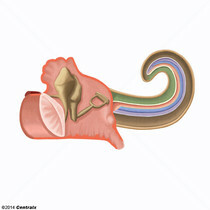 The movement of fluid in the cochlea, induced by sound, causes displacement of the basilar membrane and subsequent stimulation of the attached hair cells which transform the mechanical signal into neural activity. The inner layer of CHOROID, also called the lamina basalis choroideae, located adjacent to the RETINAL PIGMENT EPITHELIUM; (RPE) of the EYE. 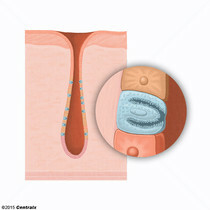 It is a membrane composed of the basement membranes of the choriocapillaris ENDOTHELIUM and that of the RPE. 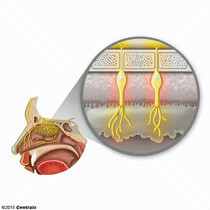 The membrane stops at the OPTIC NERVE, as does the RPE. 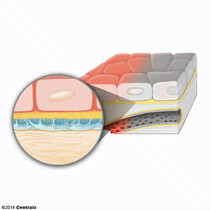 A darkly stained mat-like EXTRACELLULAR MATRIX (ECM) that separates cell layers, such as EPITHELIUM from ENDOTHELIUM or a layer of CONNECTIVE TISSUE. 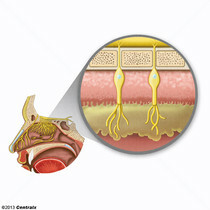 The ECM layer that supports an overlying EPITHELIUM or ENDOTHELIUM is called basal lamina. 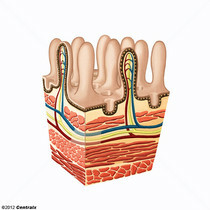 Basement membrane (BM) can be formed by the fusion of either two adjacent basal laminae or a basal lamina with an adjacent reticular lamina of connective tissue. BM, composed mainly of TYPE IV COLLAGEN; glycoprotein LAMININ; and PROTEOGLYCAN, provides barriers as well as channels between interacting cell layers. 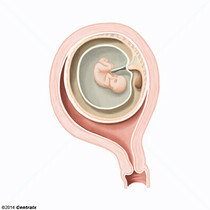 The thin layers of tissue that surround the developing embryo. 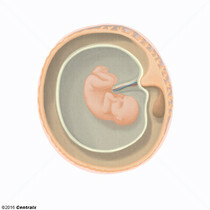 There are four extra-embryonic membranes commonly found in VERTEBRATES, such as REPTILES; BIRDS; and MAMMALS. 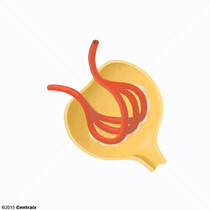 They are the YOLK SAC, the ALLANTOIS, the AMNION, and the CHORION. These membranes provide protection and means to transport nutrients and wastes. 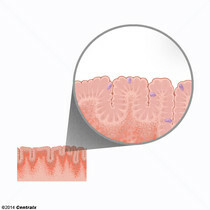 An EPITHELIUM with MUCUS-secreting cells, such as GOBLET CELLS. 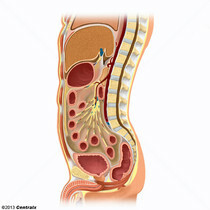 It forms the lining of many body cavities, such as the DIGESTIVE TRACT, the RESPIRATORY TRACT, and the reproductive tract. 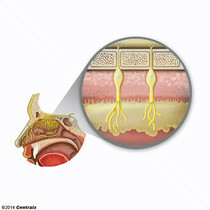 Mucosa, rich in blood and lymph vessels, comprises an inner epithelium, a middle layer (lamina propria) of loose CONNECTIVE TISSUE, and an outer layer (muscularis mucosae) of smooth muscle cells that separates the mucosa from submucosa. 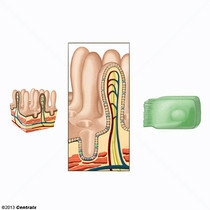 A thin lining of closed cavities of the body, consisting of a single layer of squamous epithelial cells (MESOTHELIUM) resting on a thin layer of CONNECTIVE TISSUE, and covered with secreted clear fluid from blood and lymph vessels. 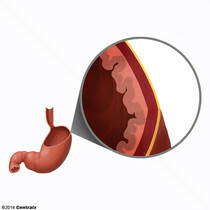 Major serous membranes in the body include PERICARDIUM; PERITONEUM; and PLEURA.